It might not have exactly the same content as were listed on GameStop's Italian portal, but the PAL region Collector's Edition of Final Fantasy XIII is nothing to scoff at. For the most part, the official PAL Collector's Edition for Final Fantasy XIII is very similar to the one Luke wrote about earlier this week. It does indeed contain the game, a hardbound art book titled "The World of Final Fantasy XIII", a series of attractive collector's cards, and a soundtrack sample CD, all packed into a limited edition package. 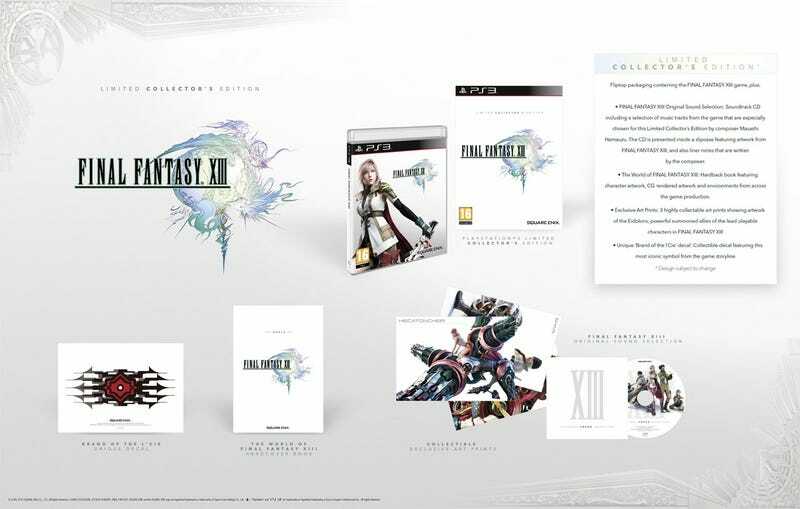 Retailer Leaks Final Fantasy XIII Collector&apos;s Edition Contents? The only real difference is the Brand of the L'Cie decal, which wasn't listed in the leaked version, and the absence of a prequel comic, which was listed. Game.co.uk lists the collector's edition at £59.99, which is roughly $100 USD. If we do get this collection stateside, let's hope Square Enix is a bit gentler on our wallets.